One of the biggest fears parents have is coping with a sick baby. When your baby has a fever or symptoms such as vomiting or diarrhea, keeping your baby hydrated is essential. Otherwise, dehydration can quickly take hold of your baby, potentially leading to complications. If your baby is still breastfeeding or drinking formula, it is okay to keep him on those feedings when he's sick. An oral rehydration solution (ORS) such as Pedialyte or Enfalyte is also an excellent option to replace fluids and electrolytes. Start with small, frequent sips of fluid every 10 minutes or so until tolerated and increase from there. A good rule of thumb is that most babies need about 1 1/2 to 2 fluid ounces of breast milk or formula a day for each pound of baby weight. However, when your baby is sick with diarrhea, vomiting, or fever she may need 2 to 3 ounces of fluid for each pound of baby weight. Typically, breast milk is the best treatment and provides all fluids and electrolytes the baby needs. However, if the baby is not breastfeeding, then oral rehydration solutions (ORS) can be given. How much ORS will depend on the baby's weight. For each pound the baby weighs, 1 1/2 to 2 1/2 ounces can be given. For example, a 25 pound baby can drink 37 to 62 ounces of ORS over-the-course of a 24-hour period. Keep in mind, if your baby is under 1-year-old, always consult with your doctor prior to giving your baby ORS. It is advisable to withhold milk products for 24 to48 hours when diarrhea is present. Milk products may be hard for your baby to digest. Your child should also avoid juice, soda, and sports drinks such as Gatorade. You can slowly introduce foods once you notice improvement. The doctor may recommend bananas, rice, applesauce, and toast to start. For children over 1-year-old, they may try clear broths, gelatin, popsicles and diluted juice. Dehydration occurs when your baby's body loses fluids and nutrients quicker than they can be replaced. When babies are sick, especially during cold and flu season, it is important to keep a close eye on their fluid intake since they are highly vulnerable to dehydration. It is crucial to watch for the following symptoms that can cause your baby to become dehydrated and if these symptoms are combined, the depletion of fluids will happen even quicker. Diarrhea is the most common cause of dehydration. If your baby has a stomach virus or upset tummy, it is especially difficult to replace fluids and nutrients after even one episode of diarrhea because of how quickly water and electrolytes are lost. Vomiting can be a symptom of the flu or a stomach virus and can lead to dehydration for your baby. A fever associated with any illness or even teething can also contribute to fluid loss. A sore throat can lead to poor fluid intake and dehydration because it is painful for your baby to swallow. 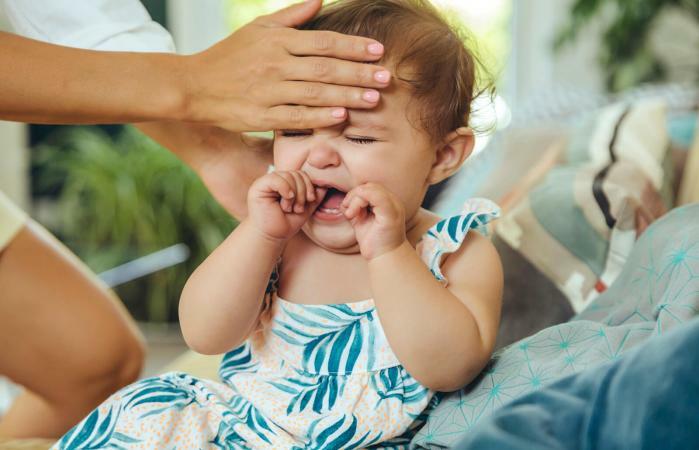 Teething itself does not lead to dehydration, but the possible symptoms that are commonly associated with teething can, such as fever, diarrhea, and poor fluid intake because the baby's mouth and gums hurt. Typically, a baby with mild dehydration can be treated and managed at home. If the symptoms progress and worsen and the dehydration becomes moderate to severe, it is best that your baby be seen by the doctor. Your child is not recuperating and symptoms are getting worse. Your child appears to be more dehydrated. There is blood in the diarrhea or vomit. Your child is in pain. Your child is resisting taking in any more fluids. Your child refuses oral rehydration solution. Due to persistent vomiting and diarrhea, your child is unable to replace the loss of fluids. If your baby does not begin to show signs of improvement within a day or so, it is crucial to seek medical attention. Do not play the waiting game. It is always best to call the doctor so he can advise you on what to do.